Calibration is the process of testing the accuracy of the readings of a measurement instrument and making any necessary adjustments if the instrument isn’t working properly. 2 For example, technicians can test the accuracy of a thermostat. Since water boils at 212°F and freezes at 32°F, placing the heat-sensing portion of the device into a pot of boiling water or ice-water can show if it’s working correctly. If readings are off, the HVAC/R technician could make some mechanical adjustments to correct the inaccuracy. What Types of Instruments Can HVAC/R Technicians Calibrate? 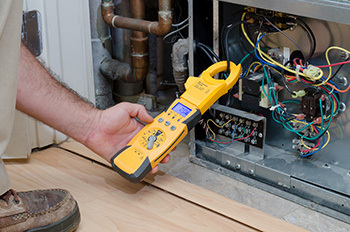 In most cases, an HVAC/R technician can test if a measurement instrument is providing accurate readings, but the tech will not always be able to correct problems with the instrument. Some measurement instruments must be sent to the manufacturer to be calibrated. Resistance Thermal Devices: Technicians can test them for accuracy but must replace them if they are out of tolerance. Tolerance is the acceptable range of readings a device may have before it is considered inaccurate. Thermocouples: Technicians can test thermocouples for accuracy but cannot repair them. Bimetallic Devices: Technicians can test and adjust these instruments to an extent. Repeated mechanical manipulation can cause them to permanently give inaccurate readings. Electronic Pressure Gauges: Technicians can test electronic pressure gauges against known pressures. These devices must be replaced if they are out of tolerance. Mechanical Pressure Gauges: These are the types of gauges found on refrigerant manifold test sets. Technicians can test and manually adjust them to ensure they’re working correctly. An HVAC/R technician can test and manually calibrate u-shaped vacuum instruments with moveable scales. Analog: Technicians can easily test and calibrate these instruments. Digital: These instruments only need to be calibrated once before they leave their manufacturer. Ohmmeters, power meters, voltmeters, phase angle meters, and ammeters are examples of electricity-measuring instruments that HVAC/R technicians can test but not calibrate. They must be sent to the manufacturer for calibration. Analog: Technicians can test and calibrate simple analog refrigerant leak-detection instruments. They usually can’t adjust complex ones. Digital: Technicians can check the accuracy of these devices but can’t calibrate them. While technicians can test both analog and digital flue gas instruments, they cannot calibrate them. They must be sent back to the manufacturer. Ensuring these instruments provide correct readings is crucial because heating systems can leak deadly gases and endanger customers.